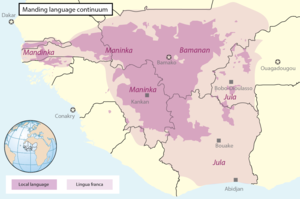 The Manding languages (sometimes spelt Manden) are mutually intelligible dialects or languages in West Africa of the Mande family. Their best-known members are Bambara, the most widely spoken language in Mali; Mandinka, the main language of Gambia; Maninka or Malinké, a major language of Guinea; and Jula, a trade language of the northern Ivory Coast and western Burkina Faso. The Manding languages, and what distinguishes one from the rest and relationships among all of them are matters that continue to be researched. In addition, the nomenclature - being a mixture of indigenous terms and words applied by English and French speakers since before colonization - makes the picture complex and even confusing. In addition, Sininkere (Burkina Faso) is of unclear placement within Manding. The Manding languages have a strong oral tradition, but also have written forms - adaptations of Arabic and Latin alphabets , and at least two indigenous scripts. Arabic was introduced into the region with Islam, and the writing was adapted to write in the Manding languages. Arabic script or Ajami is still commonly used for Mandinka. The Latin script was introduced into the region following European conquest and colonization. It is used fairly widely, with "official" versions in many countries, for teaching, literacy and publication. The N'Ko script, developed in 1949 by Solomana Kante, is designed to write Manding using a common literary standard comprehensible to speakers of all these varieties. It is gaining in popularity . A lesser-known alphabet for Bambara was developed in the early 20th century but is not used. ^ Hammarström, Harald; Forkel, Robert; Haspelmath, Martin, eds. (2017). "Manding". Glottolog 3.0. Jena, Germany: Max Planck Institute for the Science of Human History. ^ Fairhead, James; Leach, Melissa (1996-10-17). Misreading the African Landscape: Society and Ecology in a Forest-Savanna Mosaic. CUP Archive. pp. xviii. ISBN 9780521563536. ^ Belcher, Stephen Paterson (1999-01-01). Epic Traditions of Africa. Indiana University Press. p. 89. ISBN 0253212812. ^ Donaldson, Coleman (2017) “Orthography, Standardization and Register: The Case of Manding.” In Standardizing Minority Languages: Competing Ideologies of Authority and Authenticity in the Global Periphery, edited by Pia Lane, James Costa, and Haley De Korne, 175–199. Routledge Critical Studies in Multilingualism. New York, NY: Routledge. ^ Donaldson, Coleman (2017) Clear Language: Script, Register and the N’ko Movement of Manding-Speaking West Africa. Doctoral Dissertation, Philadelphia, PA: University of Pennsylvania.